As 2018 begins it opens up new opportunities and challenges to conquer. Horizon Honors not only conquered, but soared above these challenges last year. From donation drives to successful athletic teams and seasons, students, teachers, and the community all played a part in helping Horizon Honors have a successful 2017. The academic performance of 2017 was impeccable. Horizon Honors was ranked an A school by the AZ Department of Education, there was a 100 percent graduation rate, and according to the Horizon Honors Secondary website, 98 percent of the graduates went on to pursue college. The learning environment guided these successes. Horizon Honors was once again declared a No Place For Hate School by the Anti-Defamation League, creating a safe and secure setting to cultivate the students’ knowledge. The community was already improved thanks to the No Place For Hate award, but the many donation drives helped to boost the community spirit even more. Run by a variety of organizations, including Student Council, Key Club, and Model United Nations (MUN), Horizon Honors hosted events such as Relay For Life, Bids For Kids, Collect For Cures, and The Kiwanis Club’s holiday gift drive. 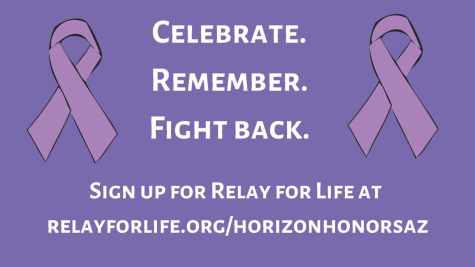 Events like Relay for Life and Collect for Cures donate to cancer research and aid those affected by it. In a remarkable result, Collect For Cures raised a total of $2,441.94. The Kiwanis Club provides gifts to approximately 19,000 foster kids around Arizona. There were also minor events that took place in either the high school courtyard or the middle school courtyard, like face painting, chocolate sale, and snow cone sale that funded different programs. Sports thrive at Horizon Honors with sportsmanship, teamwork, and perseverance leading the teams. Our varsity girls volleyball team made it to the AIA State Championship game, ending their season being near or in the top five schools in the standings throughout the season. Two girls on the team broke school records, setting higher standards for future players. The middle school volleyball team (the Blue Team) went undefeated with eight wins. Winning the league championship game, the middle school soccer team had a memorable season. The swim-and-dive team scored their first ever state qualifier in Horizon history. Although 2017 may be complete, its essence and memories are still lingering, as well as the achievements earned. Help Horizon Honors have an equally fortunate year as 2018 begins, by participating in upcoming drives, joining clubs or sports, or simply completing classwork and homework on time. A new year has begun, bringing worthwhile chances and choices, seasons and semesters, and a new beginning. Keep up the great work, Horizon Honors, and may 2018 be as strong as the year before!